Having your perfume and eating (or drinking) it too! Home / Fashion / The perfumed palate: Having your perfume and eating (or drinking) it too! The perfumed palate: Having your perfume and eating (or drinking) it too! Prada now sells… pastries? Now, that’s a new one for me. Aren’t fashion and food sworn enemies? After all, narrow-waisted haute couture is intrinsically at odds with buffet-style gorging sessions. Or has something changed and I missed the memo? Even more surprising is that Prada has actually been at war with fashion mammoth LVMH over the acquisition of Pasticceria Cova, one of Milan’s most celebrated pastry spots. 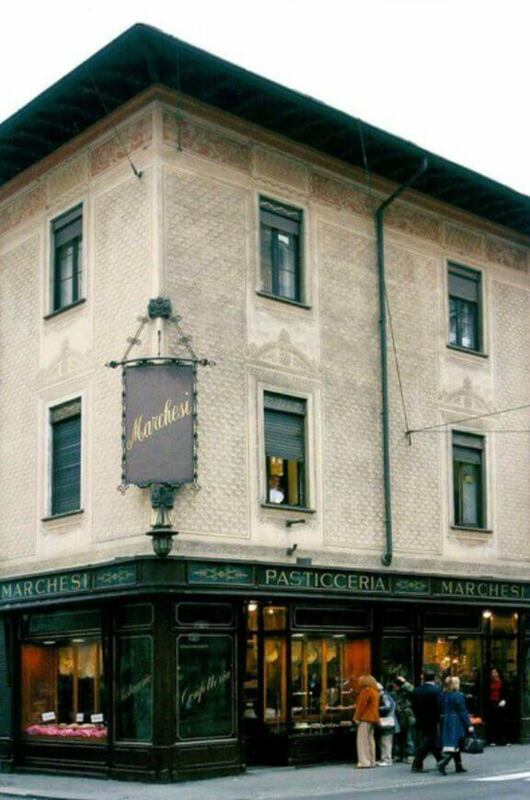 After LVMH won that battle, Prada headed over to Pasticceria Marchesi instead, taking an 80% stake in the 19th century Milanese sweetery that’s known for its pastries, chocolate and panettone. Which basically shows this is not an impulse purchase by a hungry Miuccia Prada. In fact, her eponymous label has been churning out candy-inspired perfumes since the last couple of years. Replete with caramel notes, they are called, well… Prada Candy and Prada Candy L’Eau. 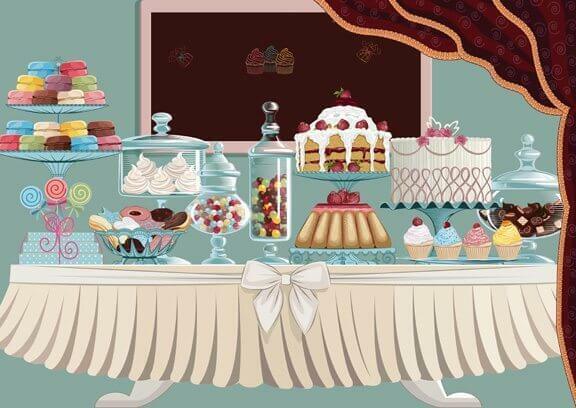 Actually, beauty and the world of sweets are no stranger to each other. Albeit in a slightly twisted, mostly non-calorific manner. Ever since Thierry Mugler’s (in? )famous Angel, gourmand perfumes have flooded the market. But today, this relationship is going even further, with a mutual co-dependance that’s fresh, fun and totally unexpected. 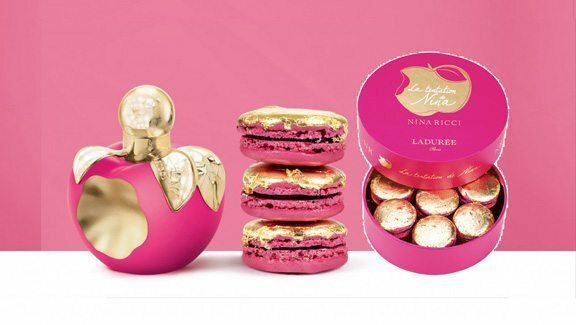 Next month, Nina Ricci teams up with Ladurée to create a delish duo: a fragrance inspired by the French patisserie’s cult macarons and a macaron infused with the perfumer’s signature scent. Fabled nose Oliver Cresp has spent several months working closely with Vincent Lemains, head pastry chef at Laduree, to create a perfect mirror harmony between the EDT and its dedicated macaron. The former is a fruity-floral that combines notes of Italian bergamot and grapefruit with Bourbon vanilla, raspberry, almond, lemon and Bulgarian rose absolute. The latter is a blend of raspberry, lemon, Bulgarian rose and almond, all topped off with edible gold leaf. Both bear the name La Tentation de Nina. What a gorgeously delectable idea. And one that makes good sense: taste, after all, is greatly dependent on smell. And Nina Ricci is not the first to explore this food-meets-perfume synergy. Earlier, fabled French pastry chef Pierre Hermes partnered with perfume legend Jean-Michel Duriez to create edible versions of classic fragrances; while Paul Gagnaire created a tasting menu based on Terre d’Hermes. Gérald Ghislain, a Parisian restaurateur-turned-perfumer, created a whole extravaganza based on perfume-inspired foods to launch Histoires de Parfums’, his fragrance label. And master pâtissier Eric Lanlard collaborated with Harrods pastry chefs to create a limited edition afternoon tea inspired by key perfume notes and ingredients for the Perfume Diaries. Penhaligon’s re-invented the wheel as well, tying up with the Marmalade Pantry to offer up a three-tier High Tea, with each tier inspired by one of Penhaligon’s fragrances: Peoneve (violet leaf-frosted dark chocolate cupcakes with a rose jam center), Vaara (scones with clotted cream and quince jam, eggplant mambaldhi, Turkish delight tartlets and tongka bean pound cakes) and Blenheim Bouquet (lemon and lime brulee, a beef sandwich with black pepper mayonnaise, and a lavender blueberry financier). Then there is the three Michelin-star Spanish restaurant in Girona – El Celler de Can Roca (some call it ‘the best restaurant in the world’) whose signature dessert is ‘A fragrance adapted: Shalimar by Guerlain’. It’s the brainchild of pastry chef Jordi Roca who’s been experimenting with perfume-inspired desserts ever since he captured “the volatile soul of [Calvin Klein’s Eternity], deciphering the formula and adapting it to an edible reality”. Other Jordi creations have captured the volatile soul of perfumes from DKNY, Caroline Herrera, Hermès, Lancôme and Bvlgari. It doesn’t stop at desserts. Grappa distillery Mazzetti d’Altavilla has wine decanters that look and behave like perfume bottles. The “scents” are numbered… No 4 Ruche is jasmine-scented, No 6 Malvasia smells like rose and No 8 Moscato smells like violet. Then there is tea, which has a lot more in common with perfume than we think: both tea and perfume require time for preparing the raw materials (growing, harvesting, and distillation or extraction), then allowing them to mature and macerate to marry all the different flavours into a balanced symphony. And just like perfume’s top, middle and base notes, tea also has different stages: the dry leaf before it’s brewed, the aroma of the brewed tea, the way it tastes on the tongue and finally, the aftertaste that is left behind, usually at the back of the palate. So, it’s not surprising that just like a whole lot of perfumers have been playing round with tea notes, leading tea makers like Marriage Frères, Maison de thé Theodor and Fauchon have been experimenting with perfume in their blends. My favourite is the Butterfly Jasmine from David’s Tea Menu – a rare reserve Chinese green tea that’s hand-picked and then layered with fresh jasmine petals night after night until the scent and flavour are indescribably deep and sweet. This is very similar to enfleurage, except that here it’s tea leaves that soak the fragrance of the flowers, rather than fat. Jean Patou’s Joy, anybody? So, is this the beginning of a new era? One in which food is no longer taboo? Can I look forward to loads of biscotti and Florentines at the Prada show? Is there any perfume whose essence you would like to taste? Or any dessert you would like to wear as a perfume? So cute the packaging wins me over! I liked the packing alot and like everyone says a book can be judged by it’s cover.